"A riot of colors, a kaleidoscope of images, a maze of patterns and textures that speak of a collective spirit! " A riot of colours, a kaleidoscope of images and a maze of patterns and textures that speak of a collective spirit, echo the innermost feelings of the Indian folk artist. 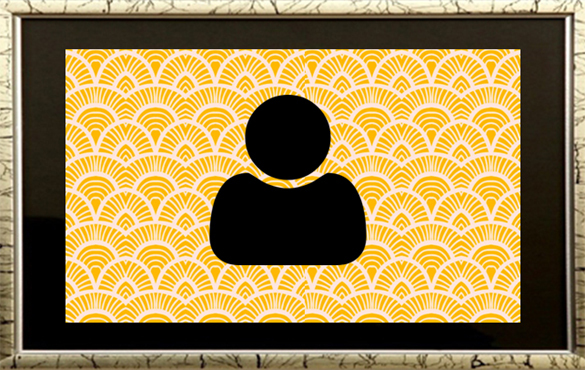 At times a performer as well, the visual folk artist works with a song in his or her heart. An art for the artist is a lifestyle, woven into his or her many festivals & rituals. Out of the plethora of folk art styles that abound in India, the Madhubani from Bihar and Warli from Maharashtra, which are contrasting in style, have gained the most visibility. 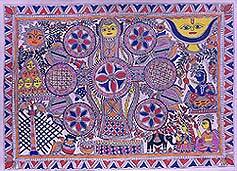 MADHUBANI ART is a famous folk tradition from Madhubani, (literally meaning 'Forest of honey'), a large farming town in Bihar, where concrete buildings vie for attention in a rural setting. The surrounding region of Mithila is Sita's birthplace, and this art form predominantly reflects images from the epic story of the Ramayana. Prayer and meditation accompany the successful execution of a painting. The 'Khobar' is the marriage-proposal fresco executed in the bridal chamber and represents a prayer for a union, which would result in the birth of numerous offsprings. Madhubani tattoos are a tradition of the Banjaras of Bihar, which began as a form of protection for the girls during the Mughal invasion. The art style is inherently simple and repetitive and is usually done in strips. Warli artists are animists living in the rugged part of the isolated Sahyadri range. By trade they are tribal cultivators from Thane district in Maharashtra. Their traditional art forms were in the past restricted to images of the mother-goddess and can be traced back to the Neolithic period. The Tarpa dance reflects the cooperation of the villagers as they join hands and sway in quick circles to the steady bass drone of a wind instrument called the tarpa. It is one of their favourite motifs. Rathwa Bhil tribal artists instal deities in the form of wall paintings at home and also paint bright 'pithoras' in basic colours on unbleached fabric. Patuas from Bengal and Phad paintings from Rajasthan are a performer's paradise, where word and image find a fine balance within the communication. Both affirm power and contain it. Phad paintings depict the 'pabu' epic of Rajasthan that forms a large, colourful backdrop to a dance drama on 'pabuji' and is played with a musical instrument called the 'jantar'. The tribal social systems that focus on cooperation rather than competition are reflected in all these art forms and are symbolic of man's superb adaptation to nature. The art of Miniature painting was introduced to the land of India by the Mughals, who brought the much-revealed art form from Persia. In the sixteenth century, the Mughal ruler Humayun brought artists from Persia, who specialized in miniature painting. The succeeding Mughal Emperor, Akbar built an atelier for them to promote the rich art form. These artists, on their part, trained Indian artists who produced paintings in a new distinctive style, inspired by the royal and romantic lives of the Mughals. A distinct temple culture was what gave birth to Mural Paintings in Kerala. The walls and the ceilings of the shrines and temples were painted with exquisite depictions of scenes from Hindu mythology. As with most of the other art fors of the region, religion formed the inspiration and provided theme to this art. 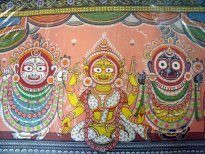 The murals painted in Kerala's various palaces and temples were full of Gods/Goddesses images and other scenes from the Puranas. The highly colorful background was formed by paintings of flowers, gardens, trees, animals and other natural elements.